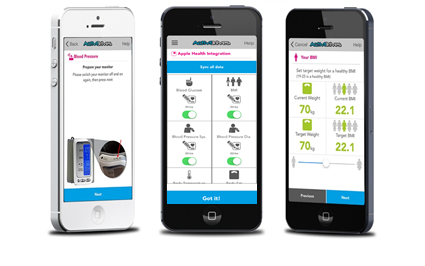 Aseptika Ltd announces the latest release of its Activ8rlives App for Health Monitoring and Food Diary version 3.2. This latest addition allows users to record data from Activ8rlives’ growing range of consumer-focused health monitors and store these data in both the Activ8rlives web-servers and Apple’s Health App (HealthKit) on iPhones to share with data from other health-related Apps. Health information that can be collected as standard by Activ8rlives and shared with Apple Health includes: Steps, weight, BMI, body fat, muscle, Peak Flow, FEV1, SpO2, heart rate, temperature, blood pressure, blood glucose, Calories, and more. Activ8rlives can also be used to create any number of customised fields or “trackers” to be synchronised with other fields as they are added to Apple’s Health App. Aseptika Limited is a healthcare company developing and marketing an integrated suite of self-monitoring devices and services under the Activ8rlives brand. We are developing integrated systems which can be used by laypeople and their healthcare service providers to better self-manage long-term health conditions (LTHC) through self-monitoring. The Company’s goal is to provide everyone with tools (and the understanding of how to apply them) so that most of us can keep healthy and well for most of the time. Self-management through self-monitoring is the motivation driving what we do. Activ8rlives is unusual in that we are device agnostic, incorporating sensors and monitors ranging from consumer accessories to in vitro diagnostics (IVDs) with a focus on respiratory disease. All data is held together and can be cross analysed in the Cloud to provide forecasts and learning for the user and clinician. The Company gained the UK patent in 2013 protecting the invention of a test for biomarkers of Pseudomonas aeruginosa (PA) in the sputum of patients, which can be used to detect the on-set of an exacerbation and profile the efficacy of antibiotic treatment for each patient. Aseptika won first place in a competition earlier in 2014 to reward the most “Promising eHealth EU SME” eHealth solution 2014 developed by an early-stage European SME. The 2014 Competition was organized by TICBioMed and had the endorsement of the Health and Wellbeing Unit of DG CONNECT of the European Commission. The judges commended Aseptika for the integrated approach it was taking in the support of patients with long-term respiratory disease, providing the platform to self-manage their illness through self-monitoring. Central to the Company’s “hospital-at-home” concept, is a test in which the patient measures the level of virulence of the bacteria living in their lungs which from time to time, flare into a full and repeated chest infections. Aseptika was a shortlisted finalist for the Cambridge News Top Innovations 2014 and AXA PPP Health Tech & You Awards. Winner of the Discovery Start-up 2014 Competition run by Cambridge Wireless and Winner of the Hunts Post Huntingdonshire Business Innovation Awards 2014. Named on Global Digital Health 100 Award list, reflecting the importance of mobile and digital solutions. Wearable Technology Awards 2015 Aseptika was shortlisted in three categories: Best Innovation, Overall Wearable Winner and was placed third in the Best Medical Device category. Aseptika was granted a patent in the United States and New Zealand protecting its invention for a test for respiratory infections early in 2015. Activ8rlives, Activ8rlives.com, BuddyWOTCH and EyKos are trademarks of Aseptika Ltd.
Other Trademarks and Tradenames are those of their respective owners.